When it came to collecting art, the early trustees of the Art Gallery of NSW aimed to follow the cultural standards of the Victorian-era British middle class. Eschewing the controversial, they favoured works that were accessible in subject matter, conventional in style, and capable of being appreciated and understood by audiences of widely differing social and educational backgrounds. The extraordinary scale of watercolour manufacture during Victoria’s reign (the Queen herself was an enthusiastic watercolourist and collector) fed an insatiable appetite for pictures that suited the pockets of middle-class consumers and addressed an audience eager for reassuring images which, in contrast to the art of the Romantic period, reflected the tamer emotions of a domestic age: ‘a gentle sentiment, an agreeable, quiet incident, a tea-table tragedy, or a bread-and-butter idyll’, according to the novelist and art critic William Makepeace Thackeray. Writing in The Pictorial Times in 1843, Thackeray contended that the new concerns of Victorian painters were ‘at least natural, which the heroic was not. Bread and butter can be digested by every man’. Images of contemporary life laced with homely sentiments comprised only one aspect of the expanding range of subject matter deemed worthy of the watercolourist’s brush. Equally popular were historical anecdotes celebrating the past and subjects from literature. The untamed landscapes of Wales and Scotland also remained favourite attractions, as did the sea and the coastlines of England and France. 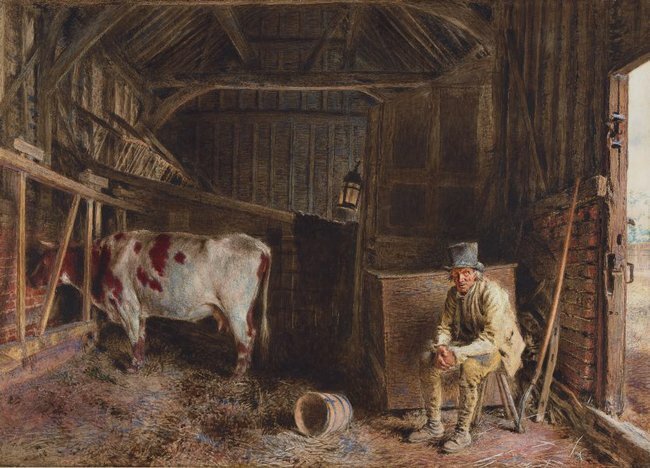 Idyllic rural scenes and country gardens became especially popular – subjects which despite their disarming prettiness nonetheless assumed added significance as defences against the ill effects of industrial cities. 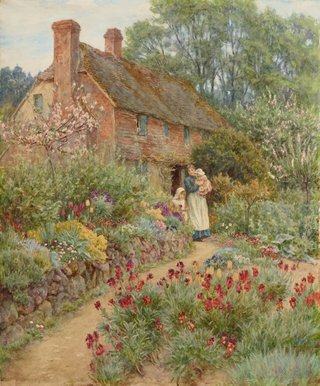 Helen Allingham, for example, offered audiences in polluted and overcrowded urban centres an unashamedly sweet vision of pre-industrial rural life, where innocent little girls were dressed-up in old-fashioned smocks and sunbonnets. Even the lattice panes of cottage windows were ‘restored’ by the artist where they had never actually existed. 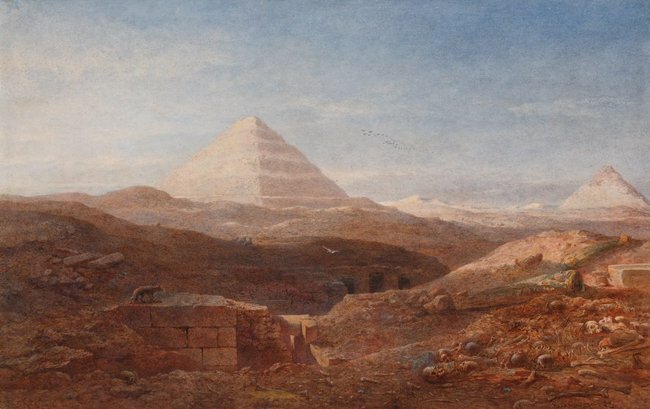 Beyond the British Isles many watercolourists found inspiration in the historic architecture of European cities while ever-increasing numbers – armed with newly invented pocket-sized Japanned tin paintboxes – discovered scenic novelties in the Middle East. Edward Angelo Goodall in many ways represents the stereotypical image of the intrepid Victorian artist, travelling to destinations far beyond those to which British painters had traditionally been drawn: as official artist on an expedition to British Guiana and a war correspondent in Crimea, as well as painting in France, Italy, Spain, Portugal, Morocco and Egypt.